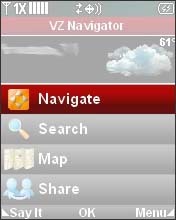 While in VZ Navigator, select Navigation. 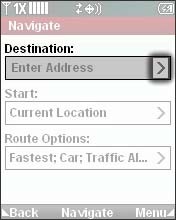 Select Destination then press the right side of the 5-way navigation pad. 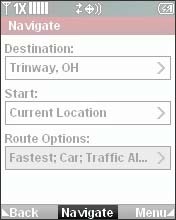 Enter an address then select Search or select an option. 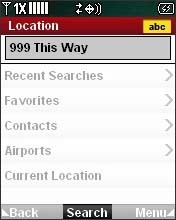 Select an option then select Search. 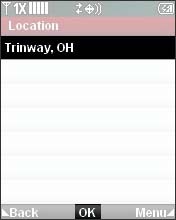 If prompted, select a specific location then select OK. 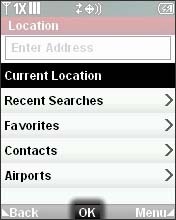 Select an option (e.g., Current Location, Recent Searches, Favorites, etc.) then select OK. 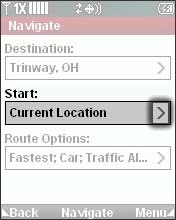 Select Route Options then press the right side of the 5-way navigation pad. Select an option the select OK. 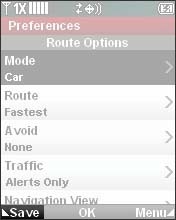 Select an option (e.g., Car, Truck, Bicycle, etc.) then select OK. 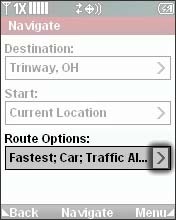 Select an option (e.g., Fastest, Shortest, Simplest, etc.) then select OK. 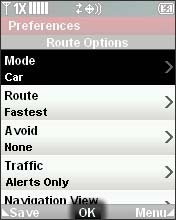 Select an option (e.g., Alerts Only, Navigation, Disable, etc.) then select OK. Select an option (e.g., 3D Perspective, 2D Top View, Dashboard, etc.) then select OK. Select an option (e.g., Show, Hide, etc.) then select OK. Select an option (e.g., Yes, No, etc.) then select OK.